Health, Life, Dental, Vision, Disability, Long Term Care, and more. 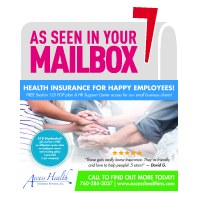 Group Health Insurance is a fabulous recruiting and retention tool. Employers with one W-2 employee can offer group health insurance. I can help you put together a comprehensive group health insurance package for your employees! Individual and Family Health Insurance can be purchased through the State Exchange, Covered California, or directly from the carriers. Contact me for more information on plan designs and pricing. The Medicare environment can be confusing. Supplements, Advantage Plans, and Part D Plans are available. Contact me so I can assist you in choosing the right Plan for you! Your greatest asset is your ability to earn an income, your paycheck. Disability insurance protects you and your family if you are unable to work by providing income which will help pay your bills and take care of your family. Access Health Insurance Services, Inc. is an independent Health Insurance Agency located in San Marcos, California. We have been in the industry, in North County San Diego, for over 20 years. We focus exclusively on the Health Insurance lines of coverage; Health, Dental, Vision, Life, Long Term Care, Disability, and Voluntary benefits. We work with Employers to evaluate the many plans available on the market today including Fully Insured Plans, Partially Self-Funded Plans, and Cross Border solutions. Reviewing the new metallic levels of coverage, understanding the benefits and value, to both the employer and the employee, is our strength. We work with Employers to implement and manage the benefits. We have dedicated Account Managers that provide support year round. We focus on the benefit administration so you can focus on your business. As dedicated Health Insurance Professionals, we also help with Individual Plans, Family Plans, and Medicare Plans. We are a Certified Covered California Agency. I was introduced to Access Health Insurance Services over 6 years ago by a mutual friend. What a great day! Lorraine has not only been there for us each yearly renewal working tirelessly to get the best insurance plan for the best pricing but is also there anytime we have questions. Lorraine Nellis with Access Health insurance has been my go-to person for my health insurance needs and questions for a number of years now. I call her my HR Dept, and as a self-employed person, she is an extremely necessary part of my business.